Is it possible? 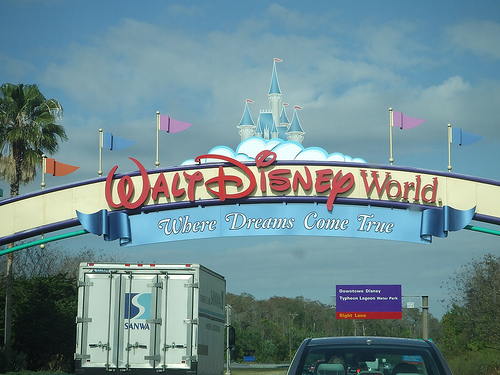 Can you actually save money at Disney World? It is possible and I am here to share a few tips with you on how to accomplish this! The first thing you need to do, unless you live very close by, is to figure out how you are going to get to the happiest place on earth. This is an area where a lot of money can be saved. Here’s how! 1. If you are flying, sign up for sale alerts through your airline of choice. This is a great way to get a heads up on airfare sales.You can also follow an airline on twitter or like them on Facebook. 2. Get a frequent flyer number. This is simple to do and after a few trips you may have earned another free ticket! 3. Book flights on Tuesdays between 10am and 2pm. These are when the best prices are released! 4. Fly on off days. Midweek flights will be cheapest. Try to avoid weekend travel. 5. If you cannot choose between flying and driving check out this calculator to help you see which will save you more money! 1. If you are staying on property my biggest suggestion is to be flexible! Disney has different pricing on different times of the year. Christmas week is going to cost more than mid January when everyone has gone back to school and work. 2. Compare deals. Often Disney has two promotions out at a time. One is a room only discount and one is a package discount such as the current stay play and dine offer. Sometimes free dining is offered. Carefully go over each package. A room only discount at a deluxe resort that then adds on tickets and dining is often cheaper than free dining at the same resort with the same tickets! Don’t let the word free fool you! This is not always the case, but it is a good idea to run the numbers on each promo. 3. Shop around. It can be done. You can get a better deal. For example, many travel agents offer gift card bonuses to clients. These can range in value but are simply a bonus. 4. Stay off property. Certainly, we all know there are great perks to being a Disney resort guest such as Extra Magic Hours and free transportation. However, some families would rather stay off site and save some money! There are plenty of great hotels near Disney World, but I suggest looking for a Disney World Good Neighbor Hotel. These hotels provide shuttles to Disney and the staff has completed the Disney Traditions training. As a perk, a lot of them also offer free breakfasts! 5. Do a split stay! Perhaps you are going to do a week long Disney vacation, but cannot justify staying at the Animal Kingdom Lodge for 7 nights. Maybe start your trip off with 3 nights at a value resort such as Pop Century and then move to the lodge to finish out your trip! Disney makes this very easy. Simply pack your bags and bring them to bell services. They will transport your bags to your new resort while you hit the parks for the day! 1. Grocery shop. You can order groceries through a service such as Garden Grocer before you arrive in Florida. Your groceries will be delivered to your resort at a time you have specified and kept cool until you pick them up. If you have a car you can simply go shopping at any of the nearby stores. The point is buy a few staples that will save you some money. We buy water, cereal bars, packaged snacks, and bagels with cream cheese. Everyone eats breakfast in the room while we get ready for the day which saves a bundle! We also bring a few water bottles and some snacks into the parks with us. This way we don’t spend money on water or too many treats. 2. Time it! A late lunch is going to cost you less than an early dinner. For example, lunch at the Crystal Place during the non peak season is $26.62. It is $39.40 for pretty much the same meal during dinner hours! Schedule a time to eat around3:30pm and you will be able to stuff yourself full. A snack around 9pm should cap you off for the evening. 3. Split it up. A lot of the meals served at Disney are huge! You can split a meal between two guests to really stretch your dining dollar. If you are using the dining plan, go ahead and split a lunch and keep the unused credit for later. Of course you cannot split dining credits at the buffets, but kids under three can eat off of a parents plate. 4. Flavor your water. Purchase a box of drink mix packets before you leave home. Flavors vary from fruit punch to iced tea and everything in between. Tote along a refillable water bottle and fill it at the water fountains. You can use the drink mixes to add a bit of taste to your water! Another good thing to remember is that you can walk up to any counter service location and request a cup of water…free of charge. 5. Find a condiment bar– Pecos Bill Tall Tale Inn has a great condiment bar. Here you can buy a simple side like fries and load it up with toppings like cheese and warm veggies for a cheap but filling snack! You can also load up your burgers and salads here as well which really helps stretch your dollar. 1. Give kids an allowance and let them decide how to spend it! Choose and amount you want to give each kid in your family to buy souvenirs and give them that amount in Disney Dollars or on a gift card. They are in charge of it. This way they are not asking “Can I have this?” all day long and they think a little bit about their purchases. Once they have spent their money there are no more toys. This way you do not go over a budget and kids learn a little fiscal responsibility. 2. Buy gift cards before you travel at wholesale clubs. Our local BJ’s wholesale club sells Disney Gift Cards at a discount. a $25 card cost $23 and a $50 card costs $47. Every time I shop there I buy a card. When I get to our Disney resort I have them put the cards on my key to the world account for spending! Last trip after saving for over a year I have $400 worth of gift cards that I only spent $368 dollars on. Not bad. This also works if you have a target card. Target sells anything at a 5% discount if you purchase using your card. This includes Disney gift cards! 3. Buy silly stuff ahead of time. Glow sticks, glitter, stickers, plush, and autograph books can all be bought for a fraction of the cost if you shop for them before you leave home. Many of these items can be found at the dollar store! Hide these items from your kids and bring them out at just the right moment to earn parent of the year status. 4. Have an annual pass? What about a Disney Visa Card? You can use these cards for certain discounts on merchandise. If you are not sure what qualifies just as the cast member assisting you and they will explain! 5. Try out pressing pennies. There are tons of pressed penny stations all around Disney World. All it costs is .51 cents! Simply add two quarters and a penny to the machine and crank! Your penny is pressed flat and branded with a cool design! These are fun little items to save. 6. Save park tickets, unused fastpasses, maps, cocktail stirrers, stickers, parade confetti, and even wrappers to use in your vacation scrapbook! So what do you do to save money? This entry was posted in Planning Tips, Saving Money and tagged airlines, animal kingdom lodge, crystal palace, flights, glow sticks, pecos bill, pop century, pressed pennies, saving money, toys. Bookmark the permalink. ← Planning Your Trip- A Step by Step Guide!